Chocolates for Valentine gifts is both traditional and modern. Let's face it. Very few people can resist gourmet chocolate, and believe me, there are plenty of us who are even thrilled with everyday chocolate treats. Chocolate and romance go hand in hand. Don't make the mistake of forgetting the chocolate this Valentines Day. Gourmet chocolate for Valentines Day is always nice, particularly for those who have sophisticated tastes in chocolate. But, many of us love chocolate of all varieties. My dear mother loved the simple and humble Hershey bar and passed that love on to me. We didn't need to have a fortune to bring her a lovely Valentine treat. She was happy with the simplest gift of a single Hershey candy bar and we knew that she was pleased. Of course, as I grew older and began to earn some money of my own, buying a bigger and better treat was so much fun. Chocolate covered cherries, delicious creamy fudge, and chocolate covered raspberry jelly sticks were a few of the chocolates for Valentine gifts I chose for her over the years. My husband is one of those unusual people who isn't a mad chocoholic like me. He doesn't dislike chocolate, but doesn't crave it either - poor thing! Even so, a 1 lb. bag of M&M's would be enough to make him happy for quite a while. I'd fill a glass jar with M&M's so he could enjoy a little at a time as his mood dictated. It's embarrassing to admit, but he usually has to hide the chocolate from me, or it will be gone before he knows it - even if I bought it specially for him! Well, Valentine chocolate is a part of our lives and has been since childhood. How about you? 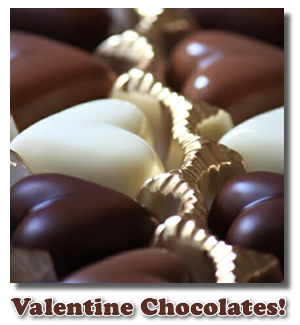 Do you associate chocolates with Valentine's Day? If so, some of these Valentine's Chocolates may be just what you are looking for to help make this Valentine's Day special for someone you love.